Background: Patients with early rheumatoid arthritis may show a qualitative change in their short-term outcome if they are treated at presentation. We tried to evaluate these patients on disease modifying antirheumatic drugs (DMARDs) commenced at diagnosis. Methods: 110 consecutive patients enrolled in this study from our rheumatology clinic, fulfilling American College of Rheumatology (ACR) 1987 revised criteria for classification of RA with disease duration of less than 6 months who had not received any DMARD. Patients were randomized to two groups irrespective of clinical, serological and radiological findings and assigned to treatment with either MTX + HCQ or SSZ + HCQ and were followed for 6 months. Results: There were statistically significant differences in clinical and laboratory parameters after 6 months in com- parison to baseline within each group but not between the two groups. There was good correlation between DAS28 and CRP when compared at baseline and after 6 months of treatment in both the treatment groups. Conclusions: Disease control is the real goal of treatment of early RA irrespective of the DMARD regimen employed. Radiological changes may be found even in early RA and may call for more aggressive management in some patients. Costly estimation of CRP should give way to simple estimation of DAS28. Objective: The health assessment questionnaire (HAQ) has been modified by many investigators to suit the culture and lifestyle of Indian population and these have been validated using traditional approaches. The goal of this study was to further validate the Indian version of HAQ published in 2002 by modern psychometric analysis, specifically by examining fit of the scale's data to the Rasch measurement model. 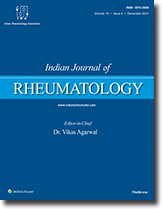 Methods: A cross-sectional study was performed on 46 patients with rheumatoid arthritis (RA) from a single center in western India. Demographic characteristics, pain score and global perception of health were recorded on visual ana- logue scale. Functional outcome was assessed with the Indian HAQ and Short Form 36 physical function (SF 36-PF). Rasch analysis was performed to examine the property of various measures and to compare them on a common scale. Result: The mean age ± SD was 45 ± 14.19 years and mean duration was 35.5 ± 52 months. 82.6% were women. The Indian HAQ highly correlated with SF 36-PF (r = 0.812, P < 0.001). Both the indices showed a moderate correla- tion with fatigue, pain, global health perception as well as disease activity scores (DAS28). Both the indices satisfied the Rasch model and were unidimensional with adequate person separation and reliability. Nine out of the 12 items in Indian HAQ were fitting in the Rasch model while in SF 36-PF scale nine out of 10 were fitting in the Rasch model. Three items in the HAQ (a) sitting cross-legged, (b) bending, and (c) lifting a cup were not fitting in the Rasch model, while one item of SF 36 'walking one block', was not fitting in the Rasch model. 2.2% of patients assessed by Indian HAQ had 0 score (floor effect), while none had 3 score (ceiling effect), while 15.2% had maximum SF 36-PF score (ceiling effect) while none had 100 score (floor effect). Conclusion: Both Indian HAQ and SF 36-PF provide unidimensional measure of physical functioning in RA. SF 36-PF has significant psychometric advantage over Indian HAQ in RA in our cohort. Patients with rheumatic diseases, such as systemic lupus erythematosus, are inherently susceptible to infections. This is further compounded by treatment with corticosteroids and immunosuppressives used to treat these disor- ders. The spectrum of infections is wide and diagnosis often difficult. Infections account for a fair proportion of deaths in these patients. Prevention is, therefore, important. This article reviews the reasons for increased susceptibility to infections, the deleterious effects of therapy on defenses against infections, and the preventive strategies to be adopted. Systemic lupus erythematosus (SLE) is an autoimmune disorder affecting multiple body systems. Neuropsychiatric SLE (NPSLE) has varied clinical and radiological manifestations. MRI is the ideal modality to evaluate the craniospinal involvement. With the advancement in MRI and its robust MR sequences, smaller lesions are increasingly being detected. It can show various lesions and complications of NPSLE like white matter lesions, cerebral atrophy, infarction, haemorrhage, myelitis, etc. The aim of this pictorial review is to present various CNS manifestations of SLE.